* A comprehensive English offline dictionary and offline thesaurus. * Offline translations of English into more than 40 languages. * Dozens of other offline translation options. * Learn the word. Clear definitions, example sentences, etymologies, illustrations, and more. * Learn how to say it. Play audio pronunciations and hear it pronounced. * Learn something new. Word of the Day and other fresh daily content. * Find the perfect synonym fast. 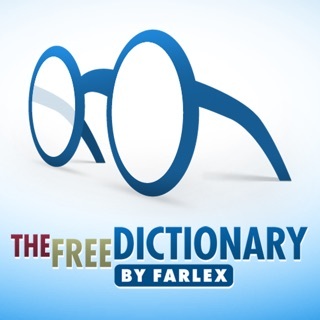 East-to-use Thesaurus with synonyms, antonyms, and related words. * Watch idioms in action. View idioms videos inside the app and see idioms and slang explained. 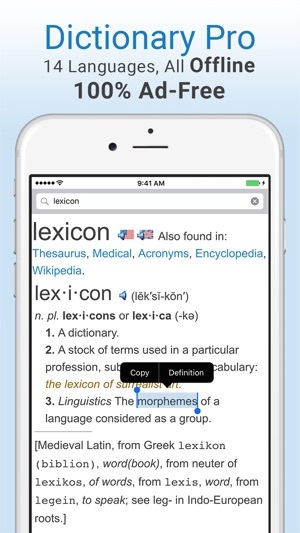 What makes Dictionary Pro the most user-friendly dictionary app? 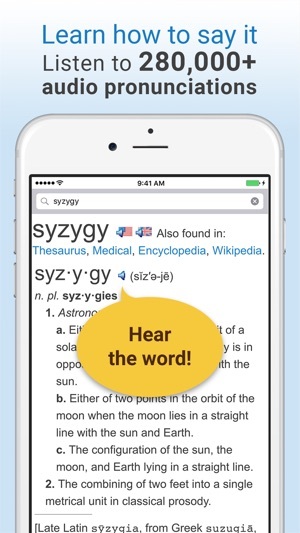 * Instantly look up words in apps or webpages! Just highlight the word you want to look up, tap "Share," then tap "More" in the bottom menu and turn on the "Define" option. You will then see a "Define" icon in the menu. Tap it to see the definition of the highlighted word! * Look up the definition of any word on the page. Just highlight and tap "Definition." 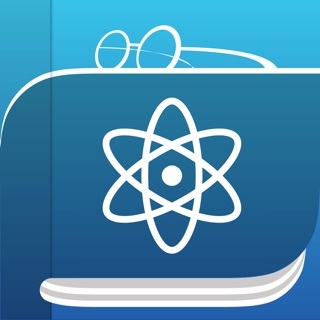 * Save bookmarks with one tap and sync them to all your devices. 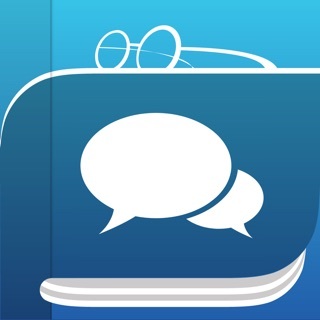 * Share your favorite definitions and articles via social networks, email, or text. 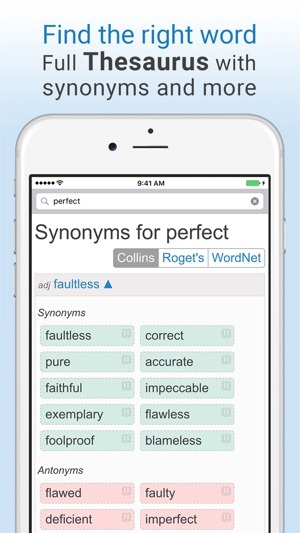 Read our reviews to see why our users say this is the best dictionary app they've ever used. 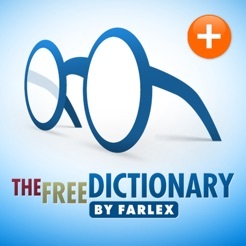 Farlex is a leader in dictionary apps. 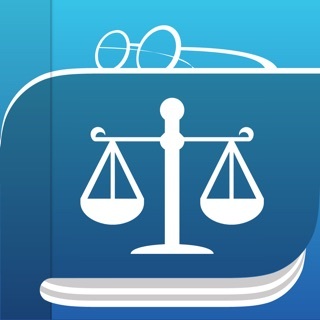 We work with the best publishers to bring together trusted content in the most comprehensive, authoritative dictionary apps on the market. 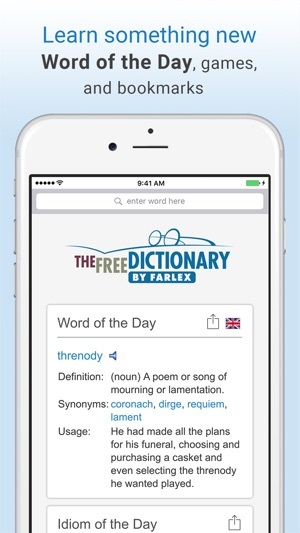 Find our other apps by searching "Dictionary by Farlex" in the App Store. 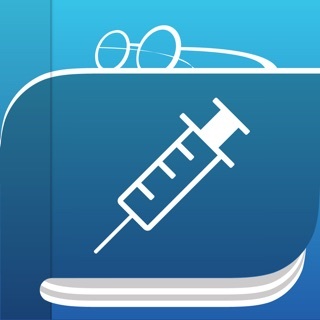 * Flashcards can now be viewed and even created offline! * Easier access to all languages. When you want to access a word in another language that’s shown in the search suggestions, you can now slide the language flags to show all options. The Free Dictionary is an app with true style!. Not only is it beautiful to look at, it's well thought out and very user friendly. The developers truly put some thought into this one! It's truly not just a dictionary. The quotes, articles, word games, even horoscope, all make it fun!. If you are like me, you know you need help in spelling and your vocabulary but you just can't seem to take the time or want to make the effort. This app will change all of that! I truly use it everyday!. And the articles, games, etc those too I use everyday. I have had both the free and the Pro versions. I travel a lot so am often without internet or unable to communicate in a foreign language. The Pro app takes care of that!. Thank you Developers for an amazing app!. There is a good reason this app has mainly five stars!. You will not be sorry with this amazing app! I used to work as an editor and have something of a fetish for dictionaries. The two highest compliments I can pay to any dictionary — either electronic or dead tree — are these: (1) I use it multiple times per day, and (2) I find myself browsing for the pure fun of it. (Fellow dictionary lovers will know what I mean.) Farlex's wins on both counts. Comprehensive, compiled from reliable sources (e.g. 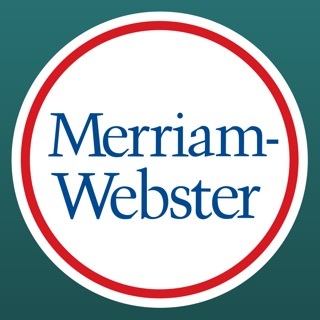 Webster's, Roget's), quick and simple interface — already these set it apart from many others. In addition, it provides accurate etymologies, a generous thesaurus, a fine assortment of dictionaries in other languages, and surprisingly good translations. The offline mode is particularly welcome. I haven't explored its many other features, but these are enough to set it apart. 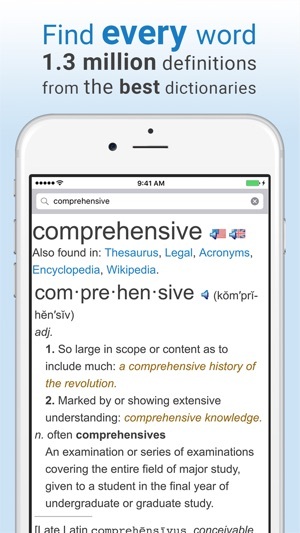 Not only is this the best dictionary app I've ever tried, it's one of the most useful reference apps of any kind. Full marks! I absolutely love this Dictionary! It not only has singular word definitions, but also various phrases! I also appreciate that it offers ideas for words in which you may not quite be sure of the correct spelling. And then there are all of the various related Dictionaries that are offered to compliment the main one! I love the choices in the many styles of the word such as the Thesaurus, old and the new, and the opposite of the word, it’s absolutely perfect for me as I write a lot of poetry. And the option to choose the settings for your home page just tops it off by offering so many ways to increase one’s vocabulary and keep your score! How marvelous for those like myself who love learning new words and expand my knowledge! Thank you again for such a fantastic set of Dictionaries to have at my fingertips.